Are you thinking of a glamping holiday in the South of France? The beautiful region of Languedoc-Roussillon is located in the Southwest, on the Mediterranean Sea, and has a mild and sunny climate. Languedoc-Roussillon offers a wide range of beautiful natural areas and beautiful beaches on the Mediterranean Sea. What more could you ask for? Go Glamping in Languedoc-Roussillon! Languedoc-Roussillon is a region full of beautiful nature parks and nature reserves, including wild horses and bulls, rock formations, caves, gorges and valleys. This region is a paradise for nature lovers, hikers, cyclists and other sports enthusiasts. There are many campsites the middle of nature and on the Mediterranean coast where you can enjoy glamorous camping with the whole family! Languedoc-Roussillon is a region full of cultural and historical attractions too. Imagine churches and cathedrals, castles, museums and many local handicrafts such as baskets, pottery, jewelry and the Catalan textile industry in Cevennes. Visit a city like Nîmes or Montpellier and stare your eyes out in the historic centre. Are you a foodie? You may find yourself in heaven in Languedoc-Roussillon. Local recipes are passed down from generation to generation and there is a wide range of delicious, fresh, local products vailable. The region is known for its high-quality fruit and vegetables, fresh fish, local cheeses and wines. In short: Glamping Languedoc-Roussillon is a feast for foodies! Would you like to enjoy luxury camping in France? Glamping is the ideal way to enjoy the freedom of camping in the South of France, yet still be able to enjoy luxury and comfort! 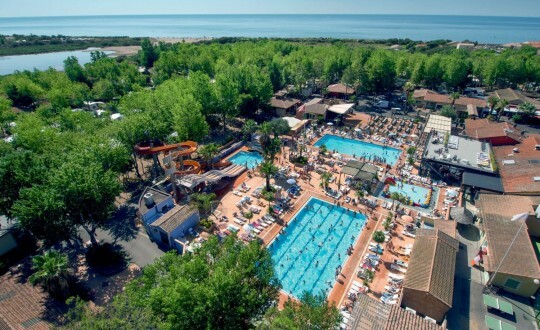 Check out the luxurious glamping accommodation on different campsites in Languedoc-Roussillon.